This book provides an introduction to naming and directory technologies and an overview of the Java Naming and Directory Interface™ (JNDI). 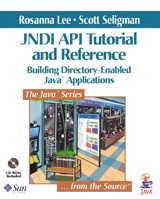 The tutorial in this book progresses from the most basic to advanced JNDI capabilities and techniques, including more than 200 working examples that demonstrate writing, compiling, and running directory-enabled Java(tm) programs. In addition, this book contains a comprehensive reference section that documents all JNDI classes and interfaces. A platform-independent interface, JNDI allows Java applications to work with standard and proprietary services from a variety of vendors-including the Lightweight Directory Access Protocol (LDAP), Novell Directory Service (NDS), Microsoft Active Directory, and the Solaris(tm) Operating Environment Network Information Service (NIS)-so that enterprises need not lock into a single-vendor solution. Specific topics covered include: Accessing the LDAP via JNDI Using the directory as an object repository Configuring a JNDI client Handling event notifications from the directory Creating a federation of naming systems Building a JNDI service provider All developers using the Java programming language to write applications or subsystems that access naming and directory services will find this book an indispensable resource.